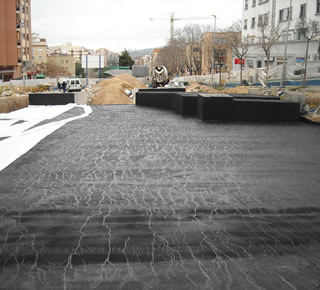 PRENOTECH is a waterproofing system which combines various chemical such as asphalt and polymers. The material obtained by cold-blending these ingredients creates a highly waterproof membrane with superior elasticity and resistance to ageing. PRENOTECH results are achieved by using both top quality raw material and state-of-he-art sprayer technology. This method controls the amount of product to ensure even pressure and flowrate. PRENOTECH and the setting compound are sprayed thorough separate valves, mixing together in the air. Setting occurs as both products mix together upon spraying. Once PRENOTECH has set, remove the setting compound and water quickly to leave the material seamless, strong and elastic, ready for traffic immediately. Rough surface structure. Colour (liquid application): Brown. Colour (dried): Black. PRENOTECH’s special characteristics have been certified by laboratory analysis. It is the only waterproofing procedure which may be applied to damp (not waterlogged) surfaces. PRENOTECH is not affected by rain, even immediately after application. PRENOTECH adapts to any surface regardless of how uneven it may be. The elasticity of PRENOTECH lasts for years. PRENOTECH can be used to waterproof roofs, retaining walls, irrigation channels, irrigation ponds, dams, drinking water reservoirs and tanks, tunnel construction, mines and any kind of construction work to achieve flexible, waterproof protection even under the most adverse conditions. PRENOTECH has several other advantages: its cold, solvent-free spray procedure does not pose any fire or pollution risk. Test: Exposure to UV light cycles (eight F40 UVB lamps arranged in a circle) and water immersion for 1,000 hours at a panel temperature of 70 + 1ºC. Result: No change in PRENOTECH characteristics. After 10 years PRENOTECH, retains its flexibility and elasticity. Test: Beinding 90ª, at a temperature of – 10ºC. PRENOTECH, waterproofing asphalt and polymers resists high temperatures. Test: Exposure to 80ºC in a heat chamber (slope: 75º). Result: No creep after 5 days. Test:Prenotech 3 mm thickness sample, 1000% elongation. Result: after elongation returns to its initial size. Test: Flexibility test (at –10ºC) comparing any kind of waterproofing based on a bituminous membrane composed of 60 grams of fibreglass or jute felt. Result:Fibreglass membrane cracks after 40 movements, jute filter at 120 and PRENOTECH after more than 1.500 movements. Further tests were carried out on the same samples by making approx. 1 cm cuts to the product, allowing it to recover for 24 hours and repeating the watertightness test. Result: Identical results: completely satisfactory. Test: Exposure to 3 cycles consisting of 16 hours at – 20ºC and 8 hours at room temperature. Result: Retains total elasticity with no variations observed in the apperance. To any dry or damp surface (excepting silicones). Result: holding strength of 1.4 – 4.0 kg/sq cm. Temperature range: Use at temperatures above 0ºC. Resistance:. Resists heat and cold. Does not age.